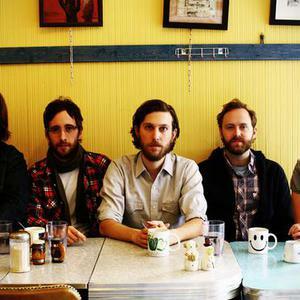 Great Lake Swimmers is a Canadian indie folk band which formed in 2003 in Wainfleet, Ontario, Canada. The band began with Tony Dekker (vocals, guitar, harmonica), Erik Arneson (banjo, guitar, harmonium), Bret Higgens (bass), Julie Fader (keyboards, vocals) and Greg Millson (drums). Julie Fader subsequently left, and Miranda Mulholland, on violin and backing vocals, joined. Fifty-five years ago, Marilyn Bell took a plunge and traversed Lake Ontario. Back then, being a Great Lake swimmer was a big deal; now, it's an astonishing physical feat taken for granted. Fifty-five years ago, Marilyn Bell took a plunge and traversed Lake Ontario. Back then, being a Great Lake swimmer was a big deal; now, it's an astonishing physical feat taken for granted. It's a rapidly forgotten part of history, like a faded map or a tattered photograph. Or a lost channel. Tony Dekker's Great Lake Swimmers have spent the past seven years performing on stages around the world - though, like Bell, they should never be taken for granted. LOST CHANNELS, their fourth album set for release on March 31st, finds them once again recording at historic locations. This time in the Thousand Islands region of Ontario and New York state, telling tales of hidden histories, still "mining for light in the dark wells," still "tuned to an instrument of greater and unknown design." The instrument in question is the singular voice of Tony Dekker, a voice that summons ghosts from times past. It's a voice that is capable of conveying heartache and comfort all in the space of a single phrase. Though his supporting cast has changed over the years?with the exception of longtime right-hand man Erik Arnesen ? Dekker has always encircled him self with sympathetic players who value spacious arrangements that frame his vocals. Over time, the band has evolved from a sparse, delicate and hushed unit into a well-rounded folk rock band, sacrificing none of their original intimacy while upping both the volume and tempos when necessary. Dekker chooses to record in old churches, community halls, abandoned grain silos and rural locations. It's easy to hear why. His voice doesn't need any studio embellishment, standing at its strongest when bathed in natural reverb and enriched by the historical context surrounding it. To record LOST CHANNELS, Dekker and company went upstream on the St. Lawrence River to the Thousand Islands, halfway between Toronto and Montreal, a historic and picturesque area that straddles the Canadian/American border, and has been designated a World Biosphere Region. Great Lake Swimmers arrived at the invitation of fan and Thousand Islands photographer/regional historian Ian Coristine (www.1000islandsphotoart.com). Coristine was able to arrange for the band to record in a number of acoustically unique spaces within the region, including one of the area's most storied landmarks, Singer Castle on Dark Island, near Hammond, NY (www.singercastle.com); as well as the historical Brockville Arts Centre (www.brockvilleartscentre.com); and at St. Brendan's Church in Rockport, ON. Additional recording took place at Halla and the Lincoln County Social Club in Toronto and the album was woven into a cohesive whole at the House Of Miracles, in London, ON, with long-time Great Lake Swimmers collaborator, Andy Magoffin. That the album was created in both rural splendour and urban Ontario makes perfect sense for a band that has always navigated the parallels between natural and urban rhythms. River imagery recurs throughout LOST CHANNELS; the title of the album is a reference to a certain passage of the St. Lawrence, close to the recording locale, where a reconnaissance boat from a British warship went mysteriously missing in 1760. There's no specific reference to the incident in the lyrics, though there are plenty of night skies, howling winds and raging rivers in almost every song which captures an elusive sense of mystery. As the album closes, Dekker sings the final lyrics? ?Like the unstoppable river? Your beauty is gentle/ but forceful, and fast? ?before the band ends on a suspended note. There is no resolution there, only eternity, a continuum, an endless river. LOST CHANNELS also features the talents of Julie Fader (flute/backing vocals), Greg Millson (drums), Darcy Yates (bass), with appearances by Erin Aurich on violin; Mike Olsen on cello; and Paul Aucoin on vibraphone; along with special guests / Swimmers collaborators Serena Ryder with vocals on ?Everything Is Moving So Fast? and Bob Egan on pedal steel. Four albums into an already-rich and storied career, Great Lake Swimmers' live show has won them ever-expanding audiences in the United States and Europe, and of course their native Canada. In 2008 Great Lake Swimmers shared the stage with an impressive list of artists, including Feist, Bela Fleck & The Sparrow Quartet, Hayden, Goldfrapp, Bill Callahan of Smog, and Robert Plant & Alison Krauss.